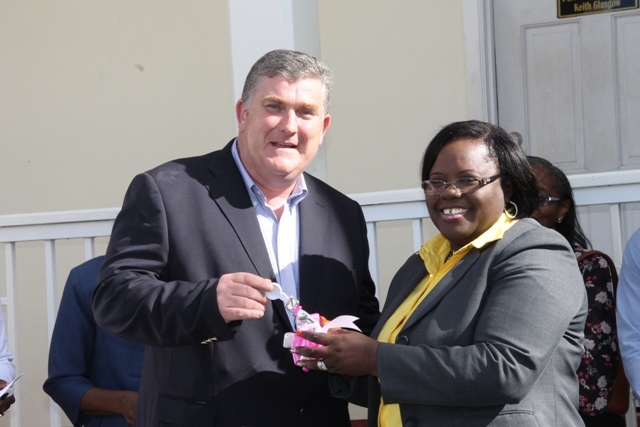 CHARLESTOWN NEVIS (MARCH 24, 2015) —The Ministry of Social Development on Nevis recently added a new programmefor the provision of specialised physical therapy to the island’s elderly and others in need of the service. 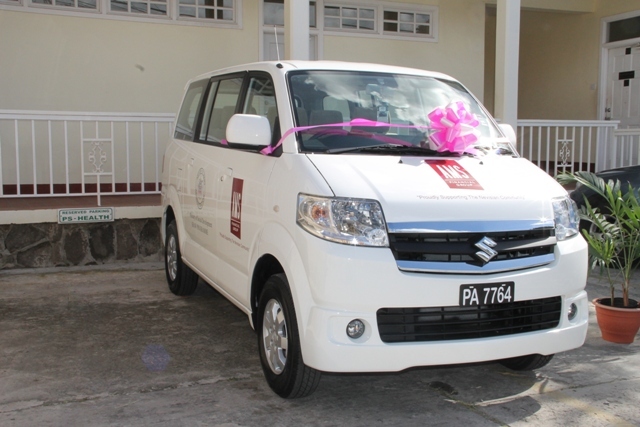 The Sports Health And Wellness (SHAW) programme was officially launched when Insurance Manager for AMS Trustees Derrick Lloyd handed over a new mini bus at the Nevis Island Administration grounds for use in the programme. During a brief but significant ceremony to hand over the vehicle to Junior Minister responsible for Social Development Hon. Hazel Brandy-Williams, Lloyd said AMS considered itself a good corporate citizen and despite several demandsfor scholarship and charitable contributions, AMS decided to give something back that would benefit a cross section of the Nevis community. Lloyd noted that the request by Minister Brandy-Williams as one which would take care of the vulnerable and the young which fitted into his organisation’s profile to give back to the Nevis community. He said that AMS had been operating in Nevis since 1999. In response to the donation,the Minister expressed gratitude to AMS and described the partnership as an important one which bore fruit after much discussion and some setbacks. She said she approached Lloyd when she realised there was a need for that type of service and outlined the objectives of the programme to him, bearing in mind that she was also responsible for the wellbeing of the island’s seniors and youths . In addition, the Minister explained that that were also a few cases of young persons who had become victims of the Bends (a decompression sickness also known as divers’ disease or caisson disease) and others who suffered from athletic injuries who were in need of the specialised treatment and would benefit from the SHAW programme. Director of Sports Jamir Claxton said the SHAW programme fell under the umbrella of the Department of Youth and Sportsand aspecial Unit was charged with executing the programme. SHAW was the brainchild of Hon. Hazel Brandy-Williams and was founded in 2013. He stated that the Unit was managed by Masefield Nisbett who and was supported by a staff of three persons, namely Shennel Guishard, Shoya Lawrence and Marc Manners. According to Claxton,the focus on the SHAW programme was to provide non-surgical treatment of sports injuries; strength and conditioning activities; physical rehabilitation; age specified exercise programmes; massage therapy for athletes and seniors and Physiotherapy services. He said the Department had collaborated with the Seniors Division of the Department of Social services to provide rehabilitation and exercise activities for the island’s seniors.